Your ability to write good story endings may not be as crucial to selling your fiction as the ability to write good beginnings, but it will certainly pay off in the long run in terms of satisfying your readers. Here we will review the basic types of endings, look at what makes an effective and satisfying ending, and discuss the many types of unsatisfying story endings. Bear in mind, you can find exceptions to almost every guideline here. As with all the articles on this site, use this as a source of ideas, not limitations. I have discussed the four types of story endings elsewhere, so I'll just give a brief recap here (you can check out the link later). Comedy/Happy Ending. The characters achieve the Story Goal and the main character ends up better off in the end. Tragedy. The characters fail to achieve the Story Goal and the main character ends up in a worse state in the end. Comi-tragedy. The characters achieve the Story Goal, but the main character ends up worse off. Tragi-comedy. The characters fail to achieve the Story Goal, but the main character actually ends up better off. What makes a story different from a simple narrative is that a story has meaning. It conveys wisdom. Regardless what type of story you write, a good ending must make the meaning of the story clear to the reader. If it doesn't, the reader will likely be disappointed. Human beings like to believe they can understand life and the universe, and that by making the right choices they can exercise some control over their destiny. Stories are a vehicle for conveying our understanding of the right and wrong choices. Showing that the story led to a significant, and therefore emotionally engaging, change in the characters lives. Providing justice. A happy outcome/judgment rewards characters who make the right choices. A tragic outcome should be the just punishment for a character's mistakes or flaws. Delivering the thematic message. At its simplest, the message of a story is that, when faced with such a problem/situation, the approach/principle followed by the protagonist is either the best or the worst. Indictment of the World. What happens when a bad character wins? If the protagonist is rewarded for immorality, mistakes, or character flaws, the implication is that society, God, the universe, etc. is at fault for allowing such injustice to occur. Such stories are a little unsettling, because they undermine the reader's sense of justice and security, which is based on the belief that the world operates by fixed and impartial rules. Indictment of Humanity. when a character makes the right and moral choices and still suffers a tragic ending, the implication is often that human beings lack the power or intelligence to truly master life. We fail because our best understanding of the rules is somehow flawed. As described in the above table, much of what happens in the last act of a story is a reversal of the situation in preceding act. For instance, at the crisis or 4th Driver (the major turning point at the end of act three), things will look their worst for the protagonist. But then the Final Driver, in act 4, will be the event that reverses this and brings about victory. Or, if you are writing a tragic story, the crisis will be the moment when the protagonist seems on top of the world and the Final Driver will be his ultimate downfall. After the Final Driver, you should illustrate the end of each of the four throughlines. 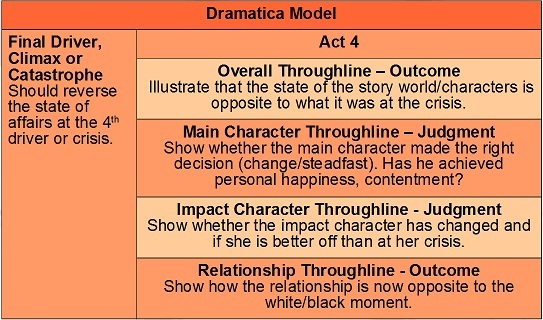 For the Overall throughline, show what the world is like for most of the characters as a result of the protagonist's victory or failure. If the Relationship has a black moment (when it appears doomed) in act 3, show how it gets miraculously saved in act 4. (This is typical of romances.) On the other hand, if the Relationship has a white moment or a peak in act 3, show how the main and impact characters end up apart in act 4. The main character will have had a personal crisis in act 3, so in act 4 you show whether he/she is happier, content, or in a better place because of how he resolved his crisis. Did she make the right choice? And also, show whether the impact character is better or worse off in the end. When writing your story endings, remember that is is far better to show rather than tell. Don't just tell us the hero feels happier. Show him kissing the girl, spending the prize money, getting hugged by his loving family, or opening the bottle of champagne. Don't just tell the reader that the war ended in victory. Show how prosperous and happy the people become afterwards. Ask yourself what the outcome would look like if you could take a photograph of it. Or better still, if you could film an event that illustrates it. Then describe that scene in words. New information (reader should get all the needed facts in earlier acts). New problems that would create a plot arcs that interrupt or slow the pace to the conclusion. Satisfy the reader's curiosity by resolving the various dramatic arcs and throughlines, answering all outstanding questions, and showing the results of all the characters' choices. Surprise (or at least not be too obvious). A reader should be able to say "I didn't see that coming, but in hindsight it makes perfect sense." 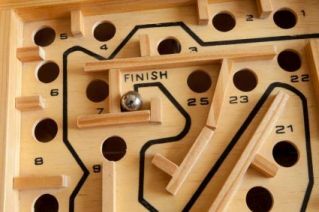 Unsatisfying story endings usually have one thing in common: they fail to deliver the meaning. However, there are lots of variations, so let's look at the different types. Sometimes the writer leaves a particular plotline unresolved. This frustrates the reader, who cannot then derive any meaning from the story events. "It was all a dream... or was it?" Some examples would be the films Inception and Bladerunner which, at least in some cuts, introduce ambiguity into the last scene. The other variation is when the writer knows what would make dramatic/emotional sense for the characters to do, but fudges the physics of how it gets done, insulting the reader's intelligence. In these story endings, the characters' efforts and choices have no real effect on the outcome, which takes care of itself. An example (mentioned in an episode of The Big Bang Theory) is the film Raiders of the Lost Ark. Despite all Indiana's efforts, everything happened as it would have if he never got involved. The villains still would have found the Ark of the Covenant, still would have ended up dead because of their own actions, and the Ark still would not have ended up in the museum. Dumb luck saves the day. In this type of ending, the character's choices don't matter because a lucky coincidence brings about the ending. This type of ending invalidates the main character's inner conflict. The threat was never actually real (the heroes were mistaken). The answer was so obvious from the beginning that the characters look like idiots for missing it. The murderer was going to turn himself in anyway, so the investigation was pointless. The deus ex machina ending. "Deus ex machina" is a term from ancient Greek theatre. It literally means "the god from the machine." In certain Greek plays, when the plot became so twisted that it was impossible to find a satisfying ending, the playwright would use a "deus ex machina." A god would be flown onto the stage (using machinery), perhaps on a cloud, who would simply declare the ending. The cavalry show up and save the day. An authority arrives and dishes out rewards and punishments. (e.g. Time Bandits). Nature (virus, tsunami, bolt of lightening, etc.) steps in at the last minute and takes care of the bad guys. E.g. The War of the Worlds. A twist is an event that shifts the frame of reality from one perspective to another. They can make for fun endings. But there are good twists and bad twists. Bad twists falsify the reality established in the preceding events, so that they make less sense. As a result, the story becomes less meaningful. Good twists, on the other hand, reveal the truth behind the preceding events in a way that resolves discrepancies and makes the story more meaningful. In this ending, all the good guys survive, get their wish, and resolve their problems happily. No one suffers for their mistakes/flaws (except perhaps the villain). The trouble with this is that it seems unrealistic. It makes the story goal seem too easy to obtain. Then I realized I had been dead the whole time. Then I discovered he/she had been dead all along and I'd been talking to a ghost. Surprise! The main character was an animal/alien/ghost all along. And the last two survivors became Adam and Eve. The mystery of what actually happened remains unsolved to this day. * Some of these were suggested by novelist William Meikle.